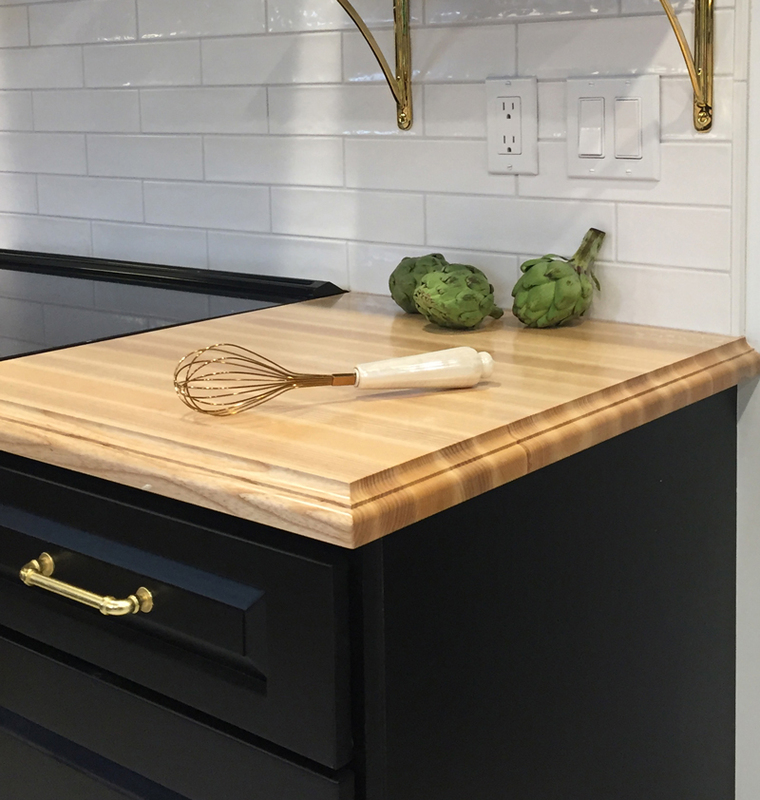 Our Custom Wood Countertops Blog features the industry’s most talented and innovative designers throughout the United States and abroad. 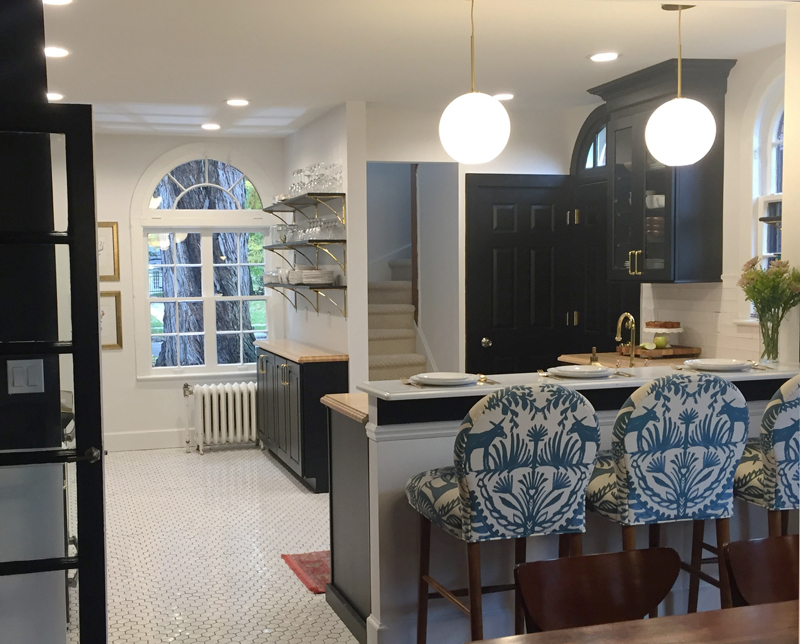 This featured design includes a Random Mix Walnut Butcher Block designed by Debbie Nassetta, CKD, CBD, CID of Roomscapes, Inc.
About the Designer: Principal Designer and owner of Roomscapes, Inc., designing kitchens and baths, laundry rooms, bars, wine rooms, etc. 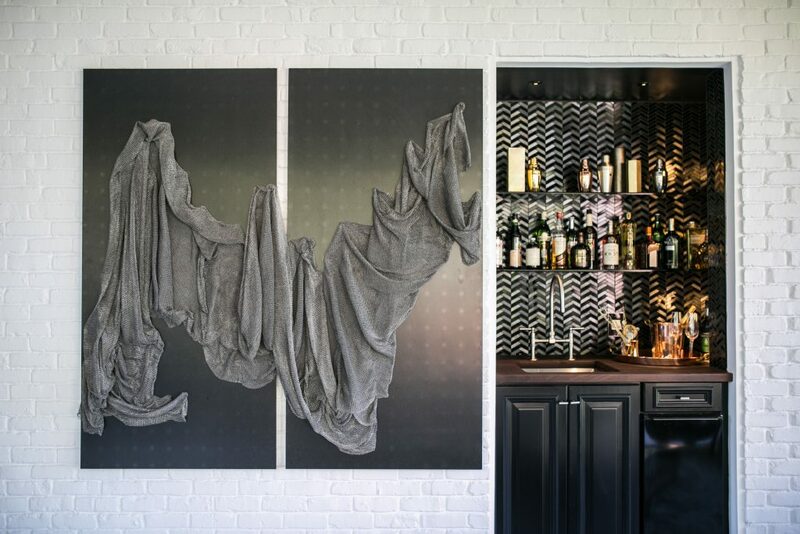 About the Designer: Don’t be afraid to mix materials. Check out more designs by Debbie by following Roomscapes on Instagram! 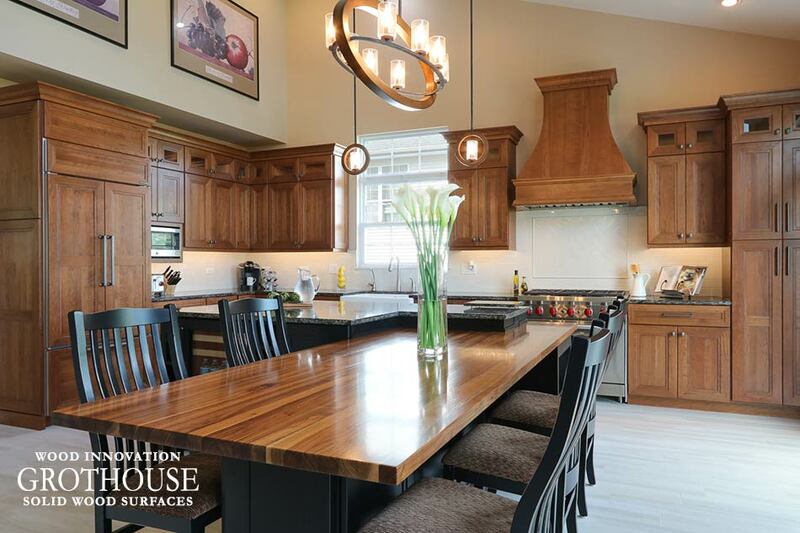 Learn more about this Random Mix Walnut Butcher Block by visiting our website. 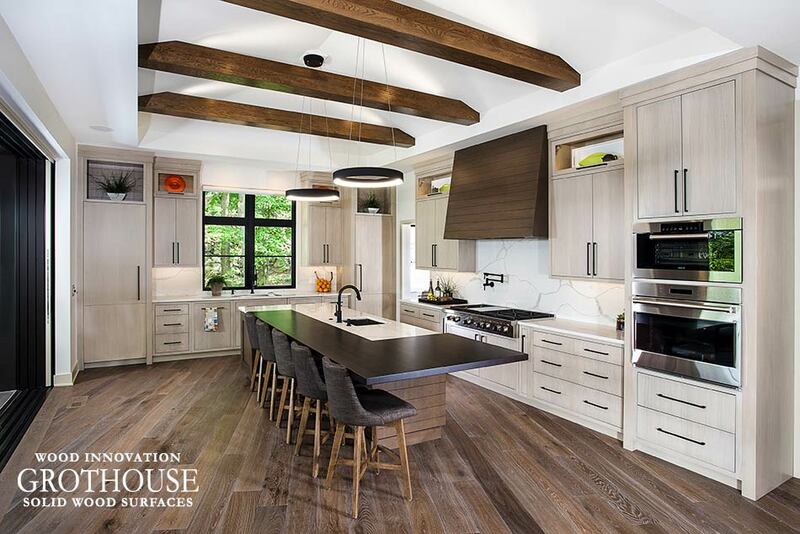 According to Houzz, one of 32 home design trends that will rule in 2019 is wood on wood kitchens. 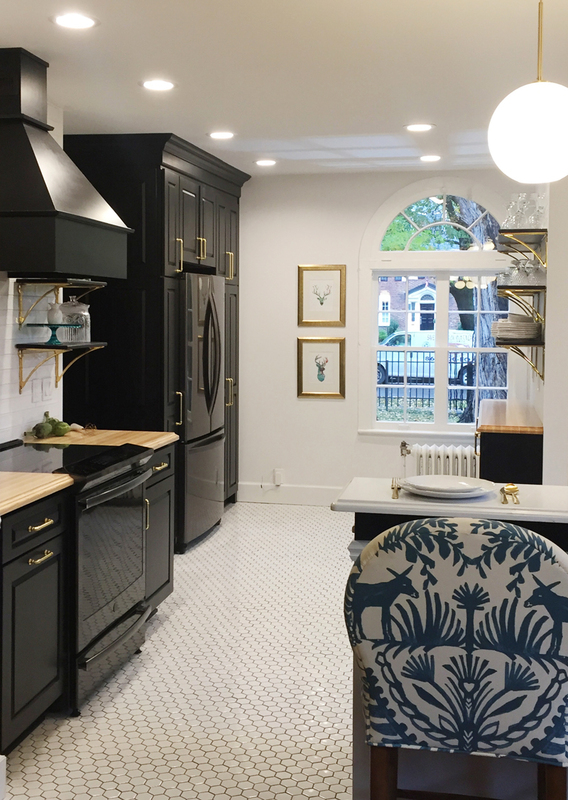 “Many of the most popular kitchen photos in 2018 featured lots of wood, and it’s easy to see why. 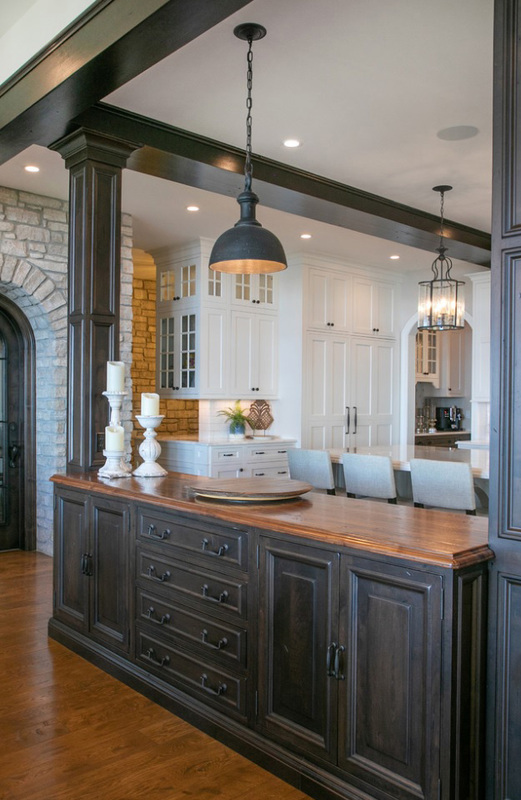 Wood adds loads of warmth and character, and it pairs well with whites and grays, two of the most popular colors for kitchen cabinets and walls,” stated Mitchel Parker. 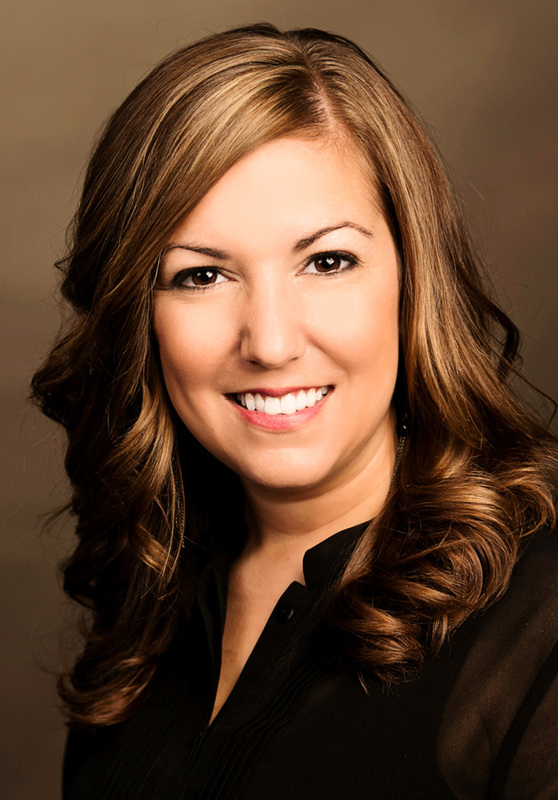 Designer Jennifer Ott noticed an increase in interest for medium-tone woods, rather than super dark or super light woods. Medium-tone woods include Grothouse exclusive species Kensington™ wood and Saxon Wood™, Sapele Mahogany, Teak, Walnut and Zebrawood. 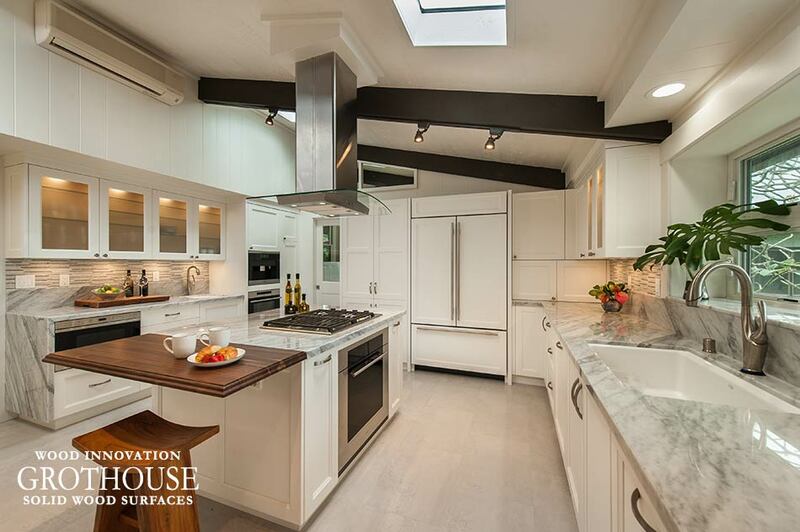 To achieve a medium-tone you can choose a lighter wood, like Ash or Maple, and then select a Grothouse stock stain. 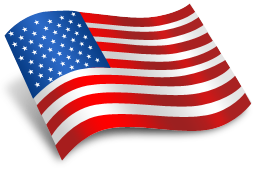 Custom stain matching is also available. 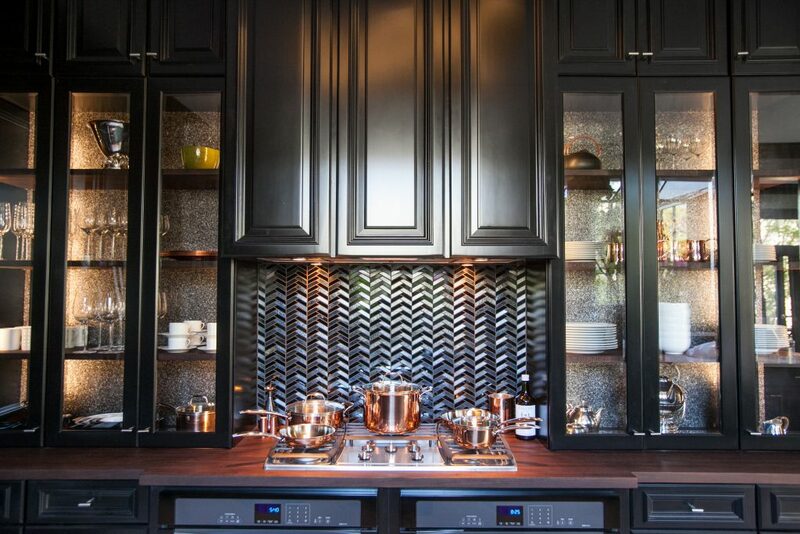 Using different elements of wood is also used to add charm to kitchen designs. 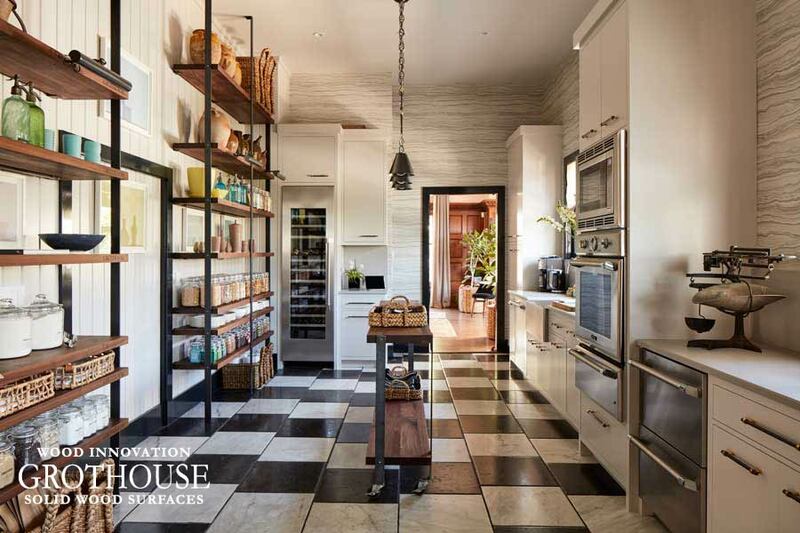 The farmhouse kitchen style trend that has been gaining popularity every year for the past three years, according to the recent Houzz kitchen trends report. 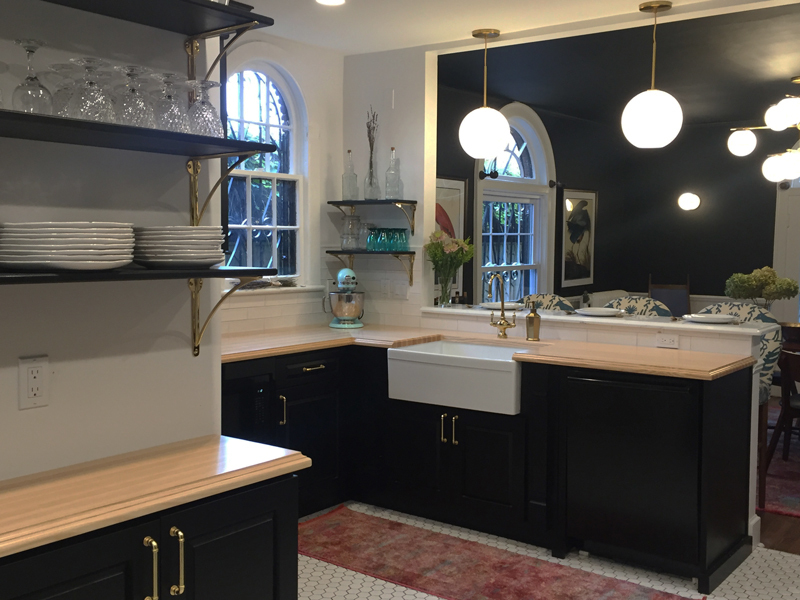 This farmhouse style kitchen was part of the This Old House® Idea House 2018 in Narragansett, Rhode Island. 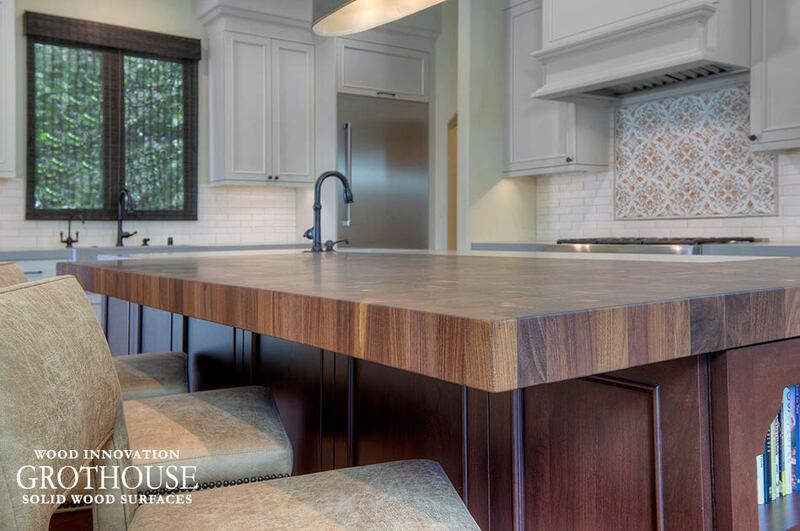 A Grothouse Walnut wood countertop was custom crafted for the kitchen island. 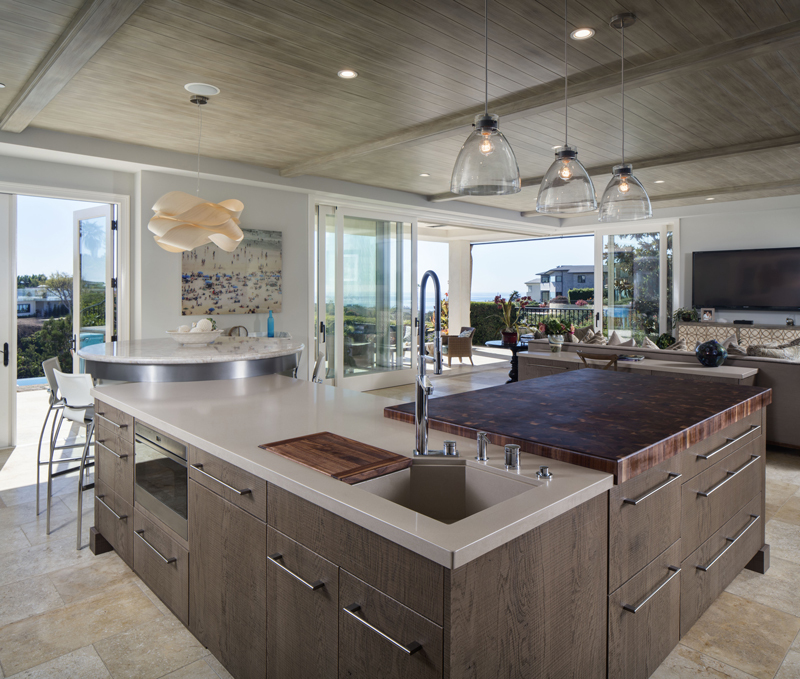 In addition, Walnut wood shelves were crafted by Grothouse to match the island countertop. 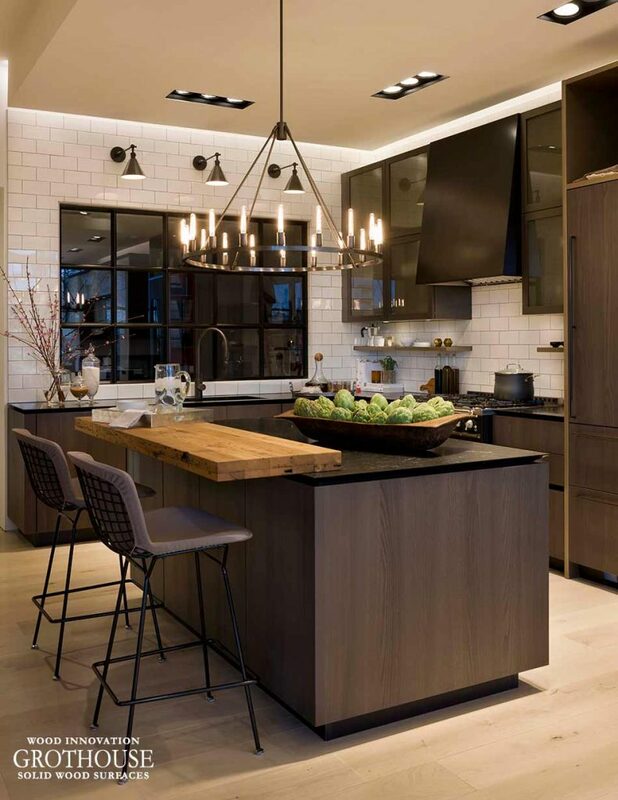 Stools with wooden seats and wood floors tie in this wood on wood kitchen. 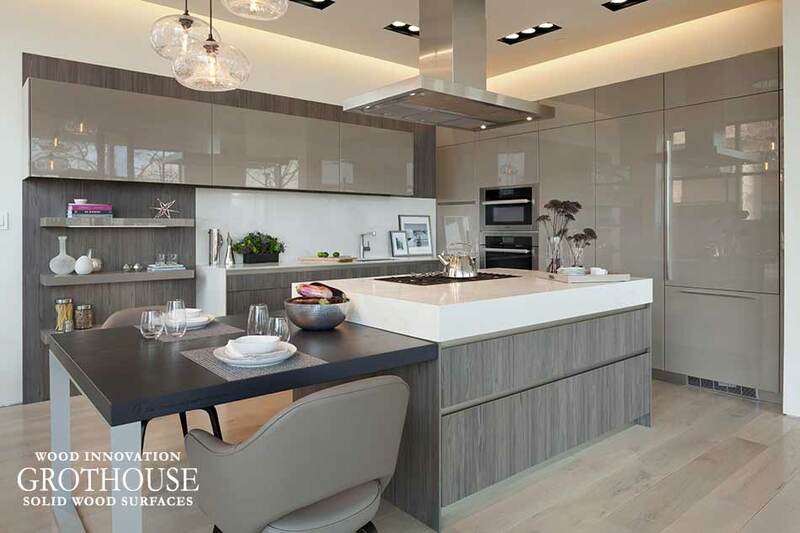 Visit the virtual Grothouse Image Library to see more designs of wood on wood kitchens. 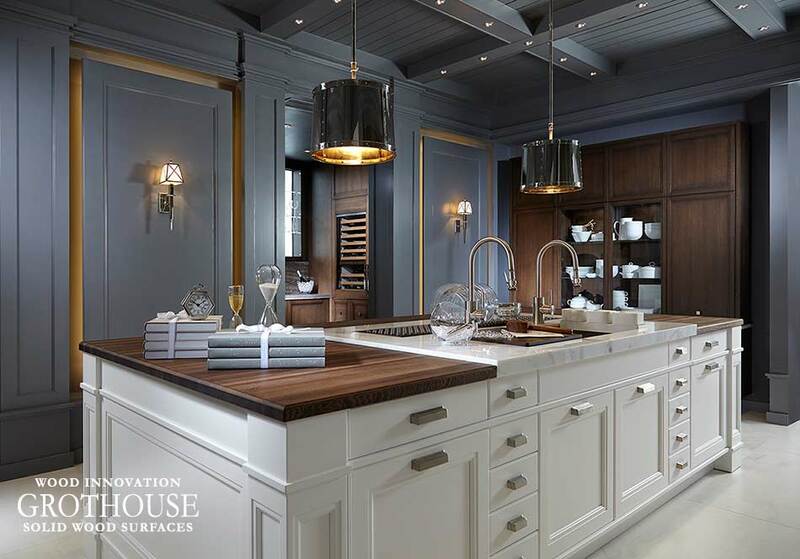 Follow @grothouseinc on Instagram and @woodcountertops on Pinterest for daily wood countertop inspiration! 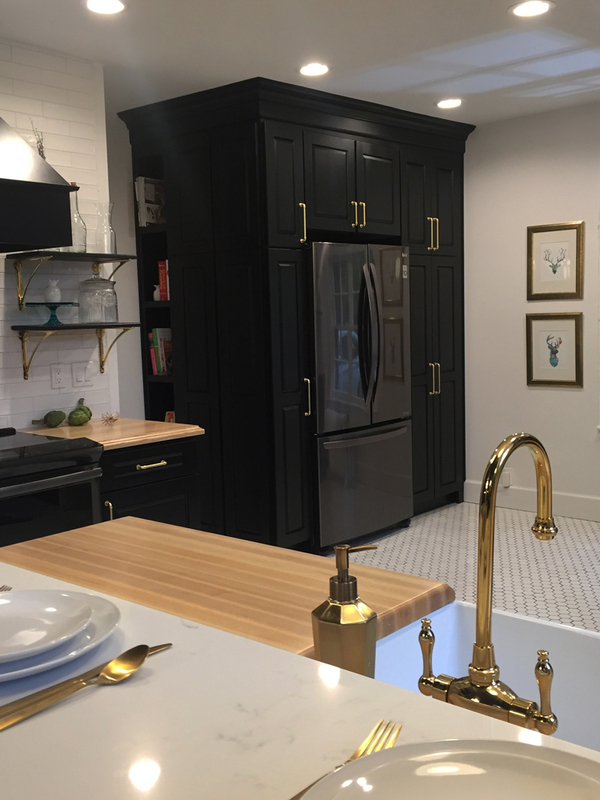 Handcrafted in our shop, southside Virginia counter tops are custom made for any style kitchen design, ranging from transitional to modern farmhouse to contemporary. 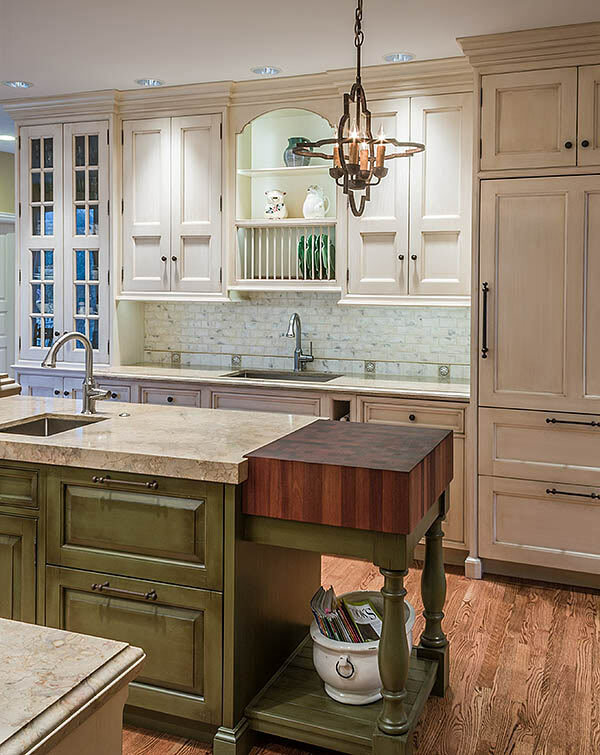 A variety of wood types are selected by designers for counter tops in southside Virginia and other areas of the state. 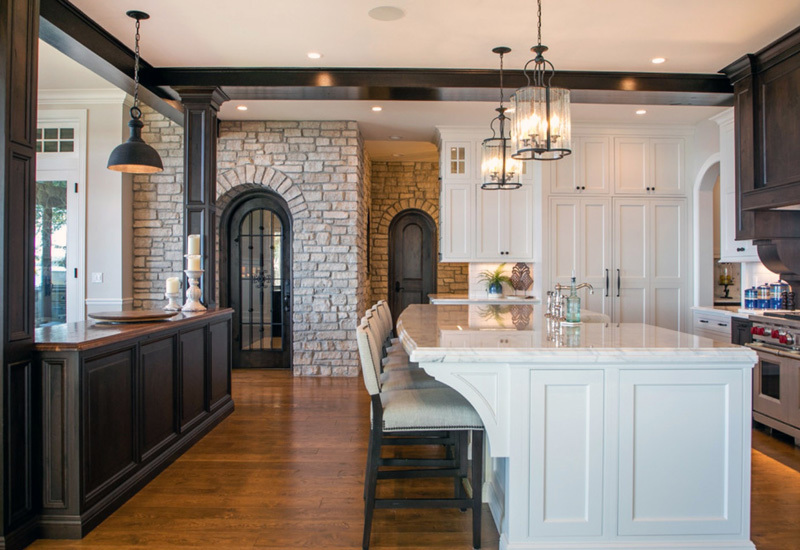 Some of the most popular wood counter selections include White Oak, Reclaimed Chestnut, Ash and Walnut. 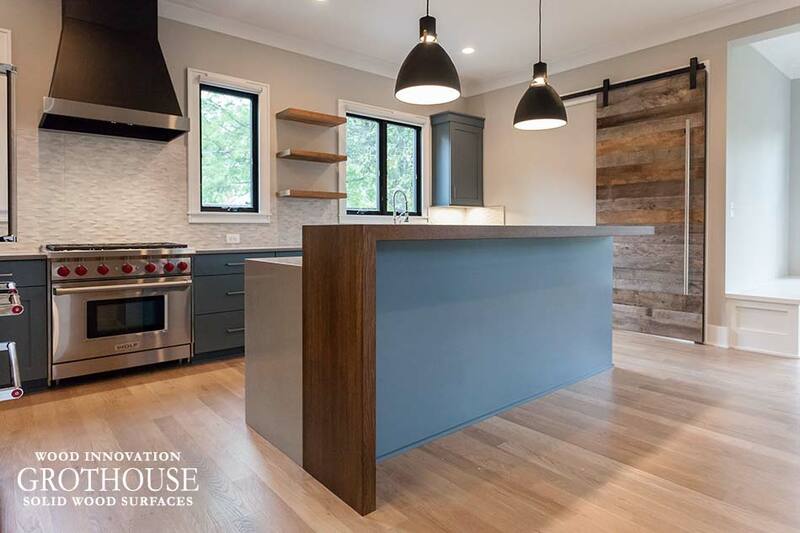 BCN Homes designed a Rift White Oak waterfall counter for a transitional home located in Virginia. 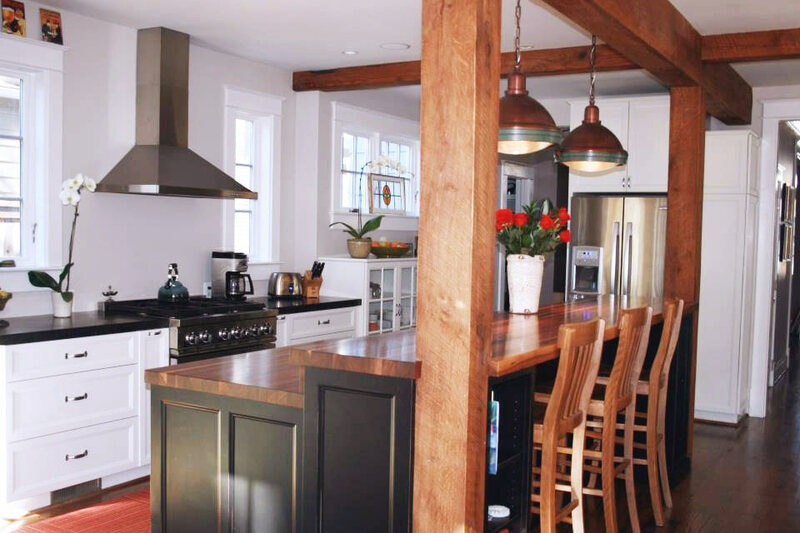 This counter matches the wood barn door and open floating shelves also incorporated in the kitchen. 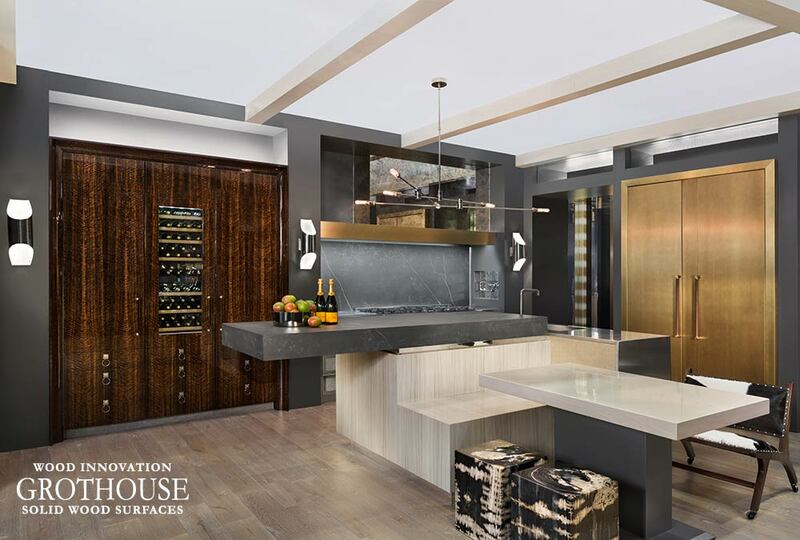 This kitchen won the Kitchen & Bath Business magazine’s Showroom of the Year 2016 Award! 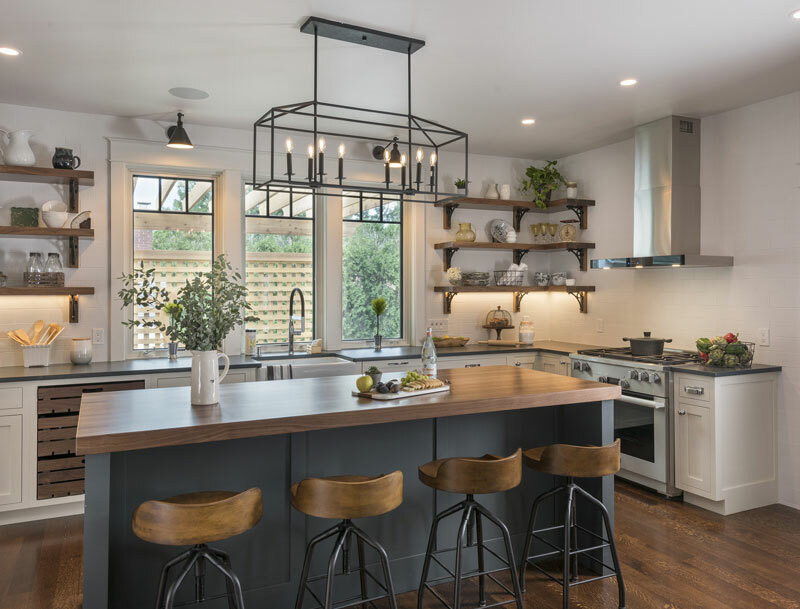 Designed by Shawna Dillon of Studio Snaidero D.C. Metro, a clean planed Reclaimed Chestnut counter makes the perfect island bar top in this Virginia kitchen. 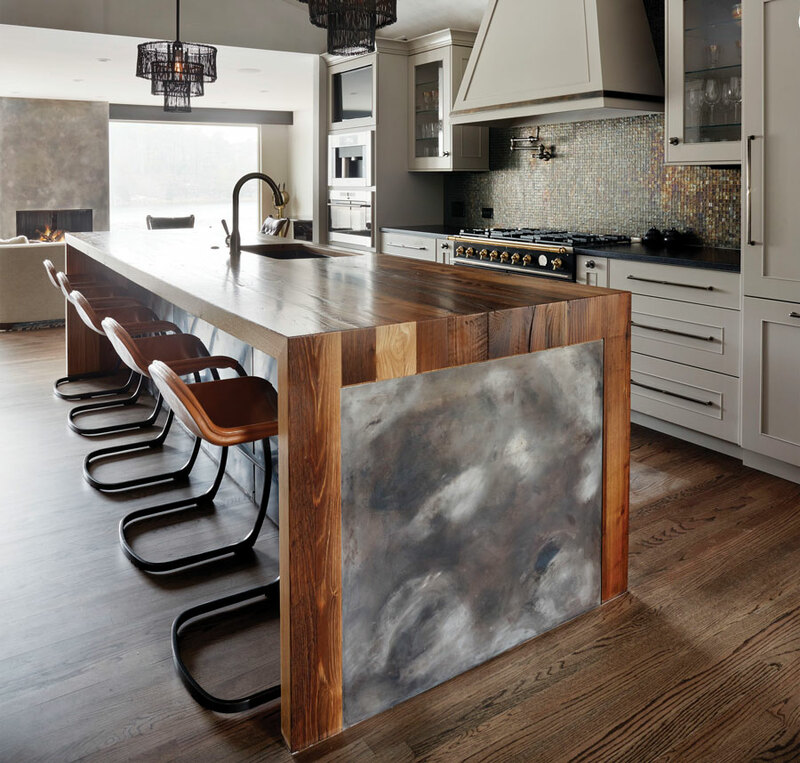 Also designed by Shawna Dillon of Studio Snaidero D.C. Metro, this modern kitchen includes an Ash table top for the end of the island. Naturally, Ash is a light colored wood, but this top was stained to look like a darker wood. 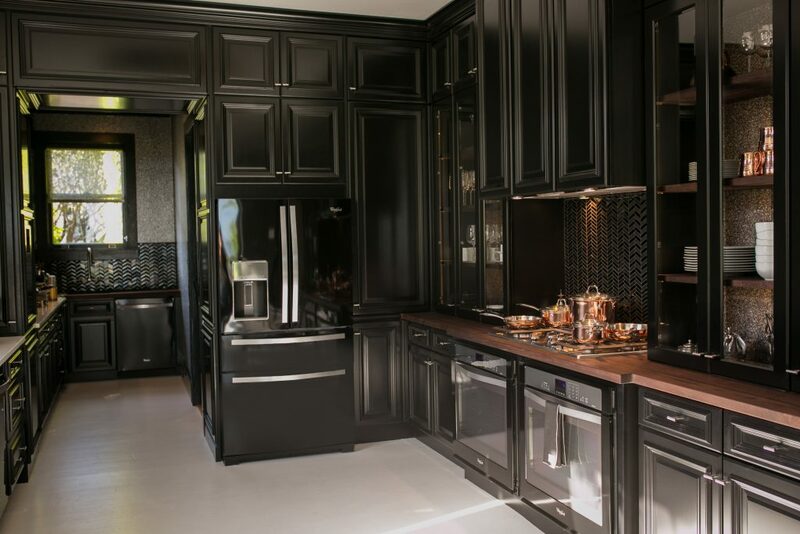 Designers often select Ash with a stain because Ash is a less expensive choice and is easy to customize for any space. 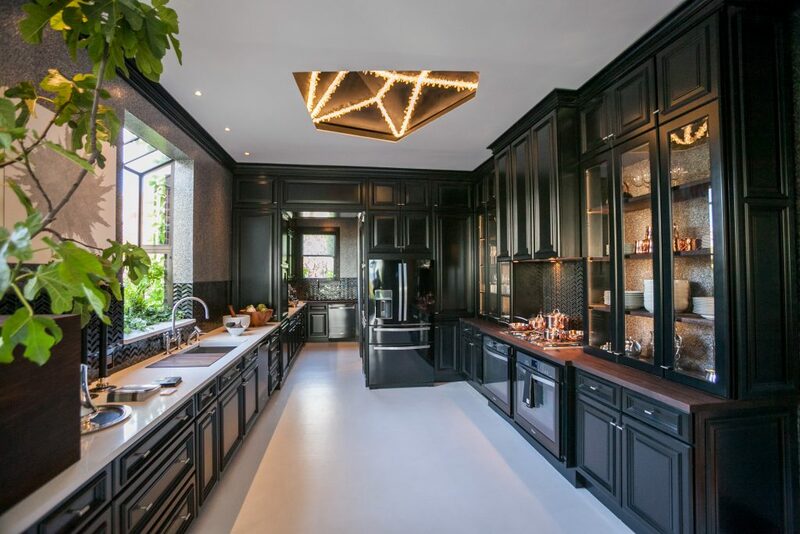 This kitchen also won the Kitchen & Bath Business magazine’s Showroom of the Year 2016 Award! 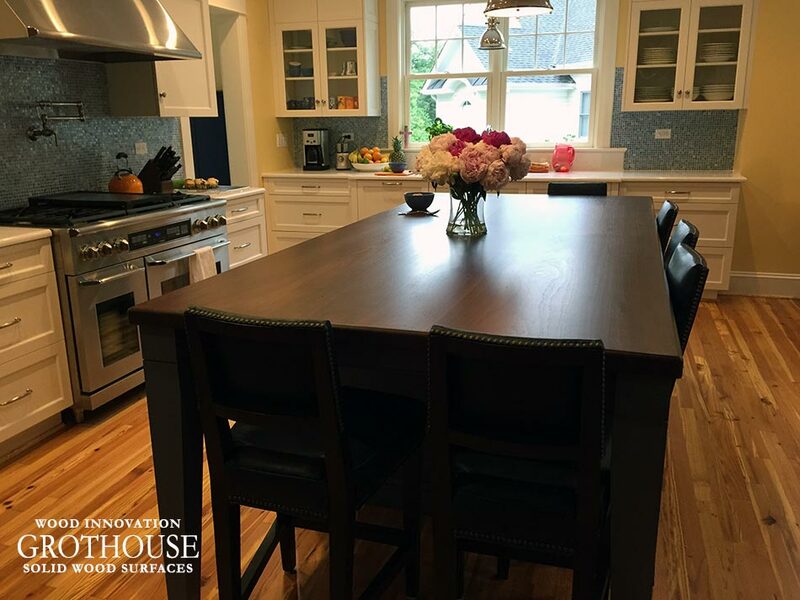 Lobkovich designed a Walnut countertop to double as a kitchen island top and a dining table top for a traditional kitchen located in Virginia. 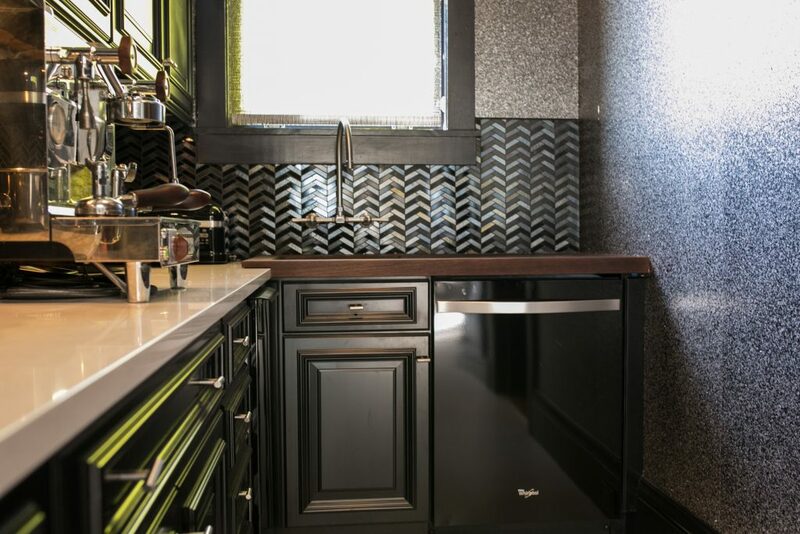 This kitchen also includes a desk top that matches the Walnut countertop. 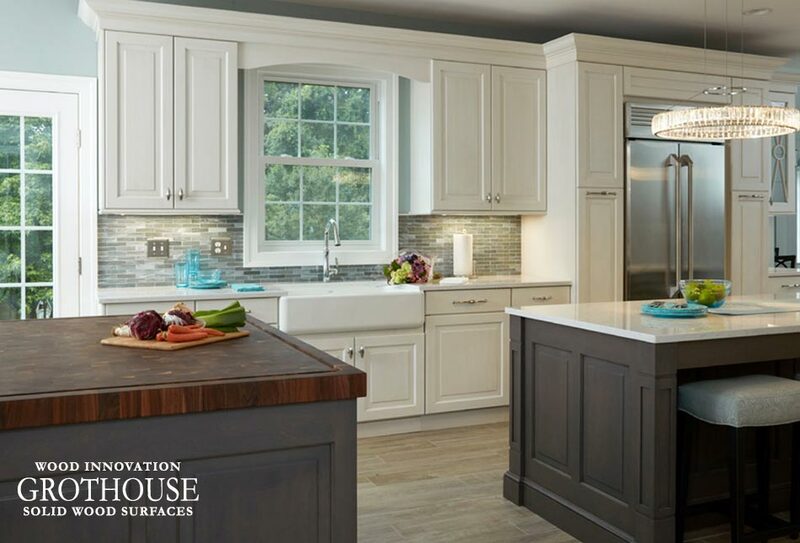 Visit the image library on our website to see more kitchen designs in Southside Virginia with Grothouse wood counter tops.